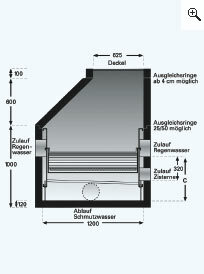 Rainwater filter for bigger roof areas. 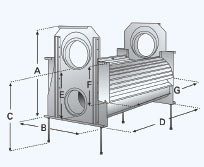 Filter for installation in a concrete ring (Ø 1000 mm). Normally standard concrete shafts are used. 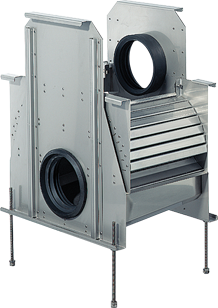 The filter can be delivered to the site yet pre-assembled in the shaft. 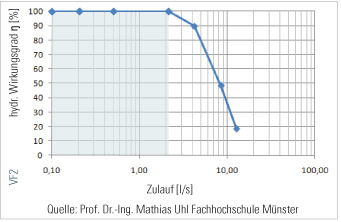 Relative connection capacity according to DIN 1986 for roof areas up to 850 m². Because of a Bypass-Installation a bigger area can be connected. Max. Flow Rate Sieve insert 3,0/sec = 10,8 m³ cleaned water per hour. 1. 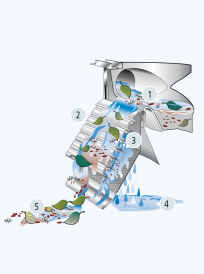 As water arrives the level builds up and overtops the filter lip, so ensuring it is distributed evenly across the whole width of the filter cascade. Installation of a filter in a pilot shaft. Installation of the filter in front of several concrete tanks which are situated in a row. If the size of the roof or the diameters of the tubes should vary from the specifications / requirements, you can make an installation according to the DIN as demonstrated below.